Headphones are now a days is a daily used device and having a headphone is not a big deal, but wireless headphones have some uniqueness as compared to other headphones which has cables that always have tangles and you feel conscious while using them. Hammacher has brought wireless headphones with Bluetooth connectivity which they had named Finger swipe headphone and these are not just wireless headphone they also possesses a unique feature which is a gesture / sense of touch support that you normally see in Tabs and Smartphones, using your finger up and down in vertical direction you can control volume while moving the finger in the horizontal direction will rewind or advance track. It also has a capability of stop music whenever there is an incoming call, headphone includes a rechargeable battery than can last up to 10 hours. 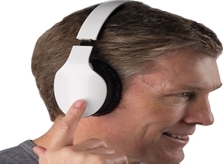 You can get Finger Swipe Headphones at a price of $149.95from the official Hammacher website.